In Zimbabwe, migration from rural to urban areas has created a demand for housing, leading to construction on wetlands, and concerns about the environment and water supplies. Conservation groups warn that the invasion of the country’s wetlands for infrastructure development and stream bank cultivation in urban areas threatens the management of underground water and the availability of the resource. They say the problem has been exacerbated by people moving from rural to urban areas. 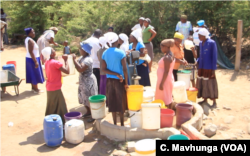 Harare authorities say they will soon start water rationing because of low levels, thus exposing residents to water-borne diseases such as cholera, as some residents might turn to unsafe water sources. Those people include Zivai Muchichwe, a father of three. Muchichwe says he built his home on a wetland three years ago as Harare battled to contain the migration from the rural parts of the country. Now, he says part of the dwelling has cracked and collapsed. Zivai Muchichwe built his home on a wetland three years ago as Harare battled to contain a migration from rural parts of Zimbabwe. Muchichwe says he is waiting for authorities to tell him whether he will be there permanently as the structure needs to be reinforced. He says it was built hurriedly with cheap material and because of the location, the problem of water underground exists. "We thought we would be here for just a year," he said. Harare authorities say they will soon start water rationing because of low levels. Dorothy Wakeling of the conservation group Harare Wetlands Trust says she was not surprised by the announcement. She says people are disturbing wetlands which are supposed to be gradually releasing water into the city’s water bodies. 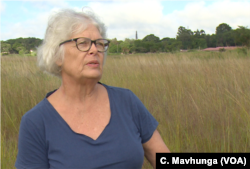 Dorothy Wakeling of the conservation group Harare Wetlands Trust says people are disturbing wetlands which are supposed to be gradually releasing water into the city’s water bodies. “If you don’t have this and you have monoculture (the cultivation of a single crop in a given area), all you have is run-off. And you have lost the opportunity to get water into the ground which is so laid out by nature. It’s not there by mistake. And we are discarding it for buildings when that is the way we get our water; we can’t make water come any other way,” Wakeling said. 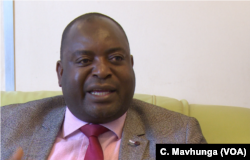 The group says it hopes that President Emmerson Mnangagwa’s government does not allow construction on the Monavale wetland which it says holds water for most Harare water bodies. Steady Kangata from Zimbabwe's environmental agency says the agency is working to ensure any disturbance of wetlands and stream banks is minimal. Steady Kangata from Zimbabwe's Environmental Management Agency says the government-appointed body is working to ensure any disturbance of wetlands and stream banks is minimal. “We must not be selfish when it comes to the environment. We are urging anyone who would want to do any form of construction to ascertain the nature and status of the piece of land they want to undertake their development…. The entire world...is about a green economy, the economy of the environment, where the environment is the pinnacle of any economy and we should mainstream environmental issues in anything we do,” Kangata said. For now, Muchichwe’s family and neighbors remain uncertain as to whether they will have a place to stay. Given that the rainy season is not set to end until about late March, they might be sleeping on wet floors.